Hi Guys, in today DM tutorial I'm gonna teach you guys on how to insert a frame into a photo. 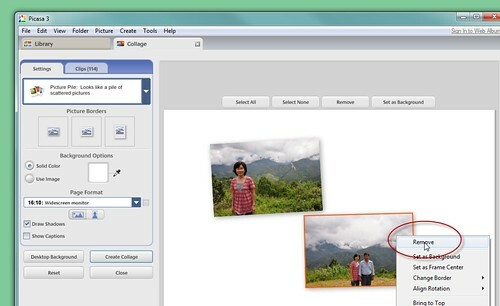 You can do so by using a FREE software called Picasa, which is a google product. 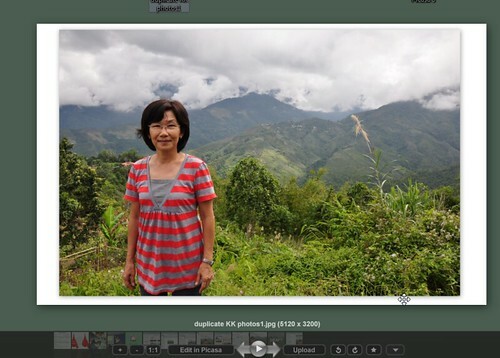 Download the free Picasa here. 01. 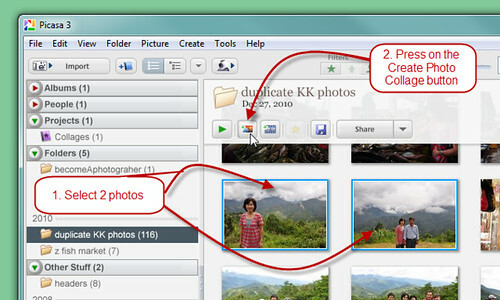 First after you finish install the picasa software, look for the icon, and double click to run the software. 02. 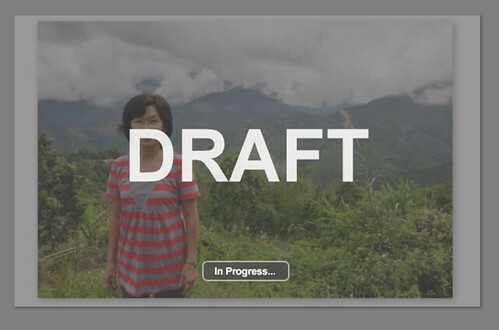 Then, we have to select the photo that we want to insert frame. 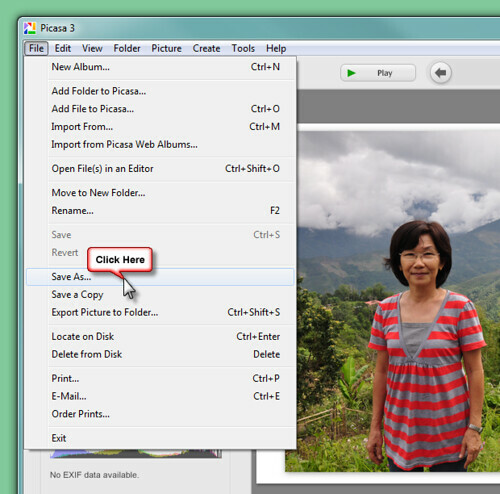 If you select one only, picasa will select all your photos in that album. 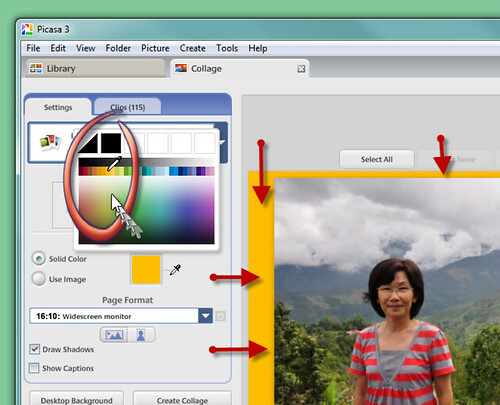 So the trick here is to select 2 photos, and click on the "Create Photo Collage" button. 03. Ok, here we remove that 2nd photo. You just point your mouse pointer there, right click and select remove. 04. Then, we have to make sure that the photo is fit into that canvas. So we have to manually adjust the photo, you do this by dragging the little round button with your mouse, hold and drag. 06. Now if you want to change the color of the canvas, you can do so by clicking on the color plate. This is next to the solid color option. 07. After you are satisfy with the color, is time to save this photos. 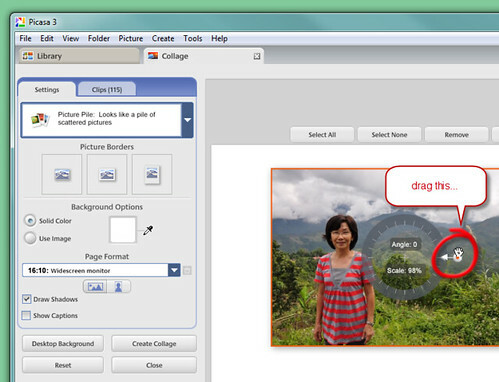 Click on the Create Collage button here. 08. If you see this, means you are nearly success. 09. Ok, now after the processing, remember to save this photos. Select File > Save As... and save this photo into your computer (remember the location you save it). 10. Walah!!! so here you have sucessfuly insert a frame in a photo (with free and easy to use software).